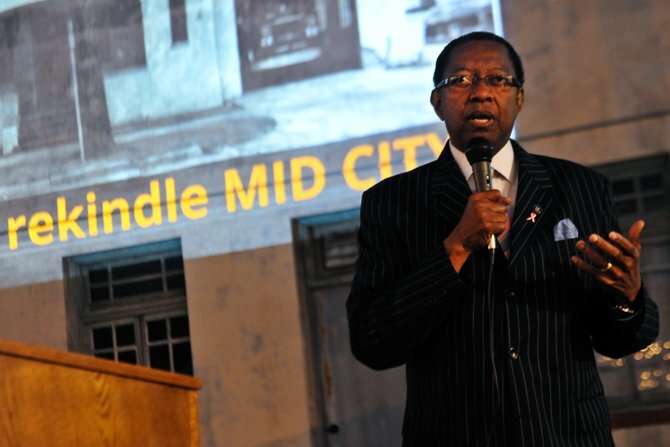 Baton Rouge mayor-president Kid Holden speaks Monday, Oct. 8, 2012, at rekindleMIDCITY, a community potluck of food, stories and people at one of Mid City's oldest fire stations. The event was put together by students in LSU's School of Architecture. 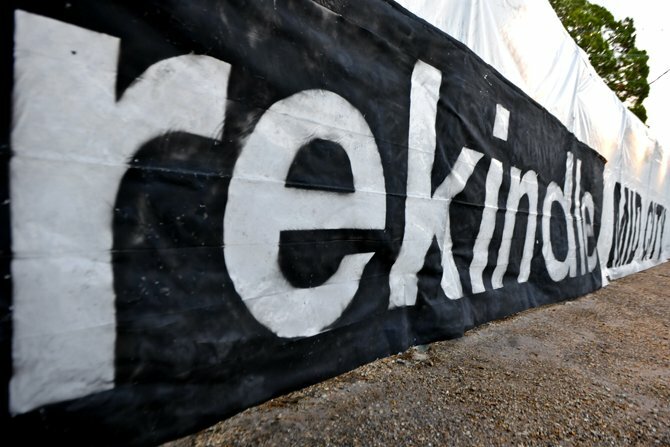 Huge banners hang in the area used Monday, Oct. 8, 2012, for rekindleMIDCITY, a community potluck of food, stories and people at one of Mid City's oldest fire stations. The event was put together by students in LSU's School of Architecture. Baton Rouge residents were able to say what Mid City meant to them on paper laid out on tables Monday, Oct. 8, 2012, at rekindleMIDCITY, a community potluck of food, stories and people at one of Mid City's oldest fire stations. The event was put together by students in LSU's School of Architecture. Baton Rouge residents listen to stories and watch a photo slideshow Monday, Oct. 8, 2012, at rekindleMIDCITY, a community potluck of food, stories and people at one of Mid City's oldest fire stations. The event was put together by students in LSU's School of Architecture. Community members gathered with food and stories at the oldest fire station in town Monday night to commemorate Baton Rouge and celebrate the event Rekindle Mid City. Local firefighter Scott Smith said the station was built on Laurel Street during the mid-1920s and operated as a fire station until last year. Smith said the building is historical because it was one of the first four fire stations constructed when the fire service was first officiated in Baton Rouge. The LSU School of Architecture, Baton Rouge Fire Department and the Mid City Redevelopment Alliance teamed up to host a community potluck. William Doran, LSU School of Architecture professional-in-residence, explained the event was much more than just food. He said this event was designed by fourth-year architecture students to meet their service-learning requirement, which focuses on community engagement. “The studio encourages architecture students to act as socially responsible professionals by designing functional, economical, sustainable projects for specific communities in Baton Rouge,” Doran said. However, Rekindle Mid City is only the beginning for these students. Doran said the 18 fourth-year students will divide into groups and design a proposal for the historic fire station. The fire station is set to be remodeled into a museum, Doran said. He said the fire station is currently in the process of becoming a landmark on the National Register of Historic Places. East Baton Rouge Parish Mayor-President Kip Holden attended the event and spoke highly of the project and the members involved. He said he looks forward to the growth of Mid City. Doran said the students will present their finished proposals at another Mid City signature event, White Light Night on Nov. 16. Elliot Manuel, architecture senior, said the date for Rekindle Mid City was chosen because it correlates with National Fire Prevention Week. Manuel said the students will begin working on their proposals Wednesday. He said he’s not certain what his design will entail yet. “I think it’s important to frame the historical nature of this building, but it’s also important to incorporate a contemporary design that fits with the area,” Manuel said. Samuel Sanders, executive director of the Mid City Redevelopment Alliance, said this is MCRA’s first venture with the architecture school, and the plan is to continue working together in the future, possibly for the spring semester. Sanders said the fire station is worth preserving and restoring.